Gone are the days of peacekeepers patrolling buffer zones between two conflict parties. Instead, they face ever more complicated large-scale situations, with diverse and fragmented actors, both state and non-state, while at the same time receiving more complex multi-layered mandates. Yet, as a recent report by the Expert Panel on Technology and Innovation in UN Peacekeeping highlights, peacekeeping “missions frequently lack a wide range of the very capabilities now considered by most militaries, law enforcement agencies and international organizations to be minimally necessary to operate effectively”. Equipping missions with the necessary materials to fulfil their mandate is crucial for protecting the lives of civilians and peacekeepers in a world of constantly advancing technology. Peacekeeping missions simply cannot ignore these developments. However, given the role of UN forces, there needs to be a thorough discussion on the ethical and legal constraints of peacekeeping. Technological advances cover all areas of peacekeeping, from communication devices to weapons systems. And the scope of reasons why these technologies are not (yet) being used for missions is similarly wide: from the simple question of cost, to developed nations’ fears about exporting advanced technologies to developing nations, who usually supply the troops on the ground, to more complex legal and ethical concerns about certain equipment. One technology under especially heated debate among policymakers and academics is Unmanned Aerial Vehicles (UAVs) – also known as drones. Drones come in many different forms and in varying degrees of autonomy: from package deliverers to reconnaissance to armed weapons systems. For peacekeeping the question of surveillance drones and the possibility of armed drones are especially paramount. While peacekeepers need surveillance to fulfil their mandates, there is a clear need to critically assess what data is collected and how it is processed. Already in 1998, a UN Resolution said that new information technologies could be used “for purposes that are inconsistent with the objectives of maintaining international stability and security and may adversely affect the security of States”. So, while international law and the UN Charter clearly apply to questions of ICT, the rapid development of technologies calls for more discussion about how these should be regulated, especially in the context of peacekeeping. 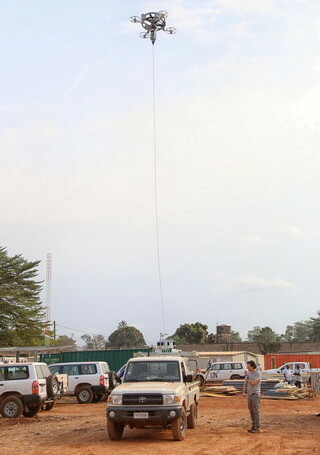 Although surveillance drones have been used by the UN since at least 2006, they have only recently become an integral part of peacekeeping operations, by MONUSCO. Part of the problem is that this new method can gather massive amounts of information from afar without either the awareness or consent of the target population. This realisation has prompted calls for a full and transparent discussion and to define clear rules relating to UN ownership of collected material. Among the most outspoken critics of surveillance drones in peacekeeping missions are humanitarian organisations, who fear it could “blur the lines between military and humanitarian actors in the conflict” – a distinction that is far from being only technical. To ensure proper functioning, humanitarian missions need to be impartial and neutral at all times; and crucially, to be able to work in difficult environments, they need to be perceived as such by all conflict parties. Yet peacekeeping missions are rarely perceived as impartial, a fact that has ethical consequences for the debate about peacekeeping surveillance. Ethical questions include the following: should drone data collected about disasters be shared with humanitarian organisations? Could this sharing of data now risk the neutrality, impartiality and independence of humanitarian work in the future? Do peacekeeping missions have the means to properly analyse all the data gathered by drones? And last but not least, do surveillance drones create a false sense of security? As the limited capacity of missions often requires peacekeepers to move on to new hotspots they have to leave other areas uncovered. But having drones ‘cover’ those areas can have two contradictory effects: recording human rights violations or armed attacks may be a deterrent to warring parties; however, without the capacity to deploy personnel to stop the violence, it may severely harm the reputation of peacekeepers. Peacekeeping mandates are changing with the new challenges they are presented with and now include tasks such as policing, counterinsurgency and promoting national reconciliation. Violence, asymmetric threats, and unclear political situations have led to a greater number of ‘robust mandates’ – whereby the principle of the non-use of force is challenged and peacekeeping missions are allowed to use ‘all necessary means’ to protect civilians, to prevent violent disruptions of the political process, and to assist authorities in maintaining law and order. These robust mandates are crucial in protecting civilians and peacekeepers, yet they also prompt a discussion about weapons technology in peacekeeping, including the possible use of armed drones. Several problems arise with the deployment of armed drones. While there are man-portable UAVs, which are operated relatively close to the front line, most are operated from a considerable distance – and not by peacekeepers but by private contractors. This raises many concerns about security, both of data but also of civilians and peacekeepers. 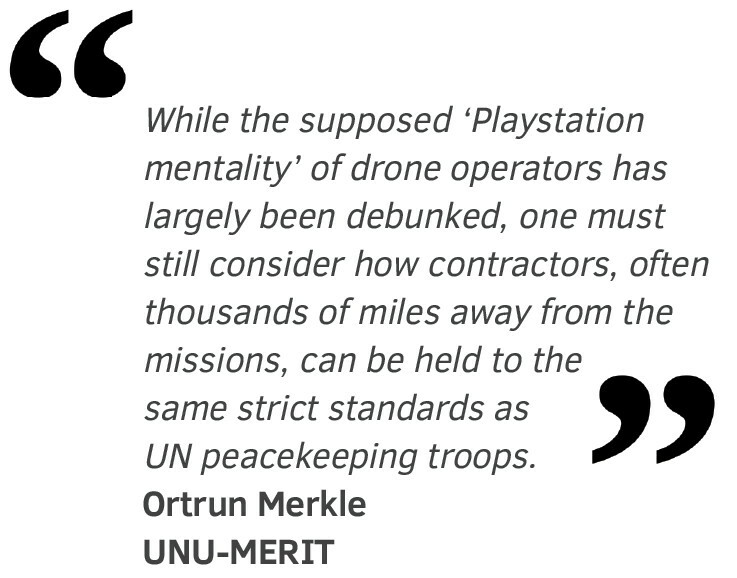 While the supposed ‘Playstation mentality’ of drone operators has largely been debunked, one must still consider how contractors, often thousands of miles away from the missions, can be held to the same strict standards as UN peacekeeping troops. The use of armed drones may well change the perception of peacekeepers. They have already been used in places like Afghanistan, Pakistan and Somalia, especially in ‘signature strikes’. Combined with collateral damage, these have stoked great resentment against coalition forces. If used by UN forces, they are likely to affect the public perception of peacekeepers, especially in areas where drones are actively deployed by multiple actors but cannot be identified. “Peacekeeping is not a job for soldiers, but only soldiers can do it,” said former UN Secretary-General Dag Hammarskjöld. We now need to ensure that UN peacekeepers are equipped for the job without compromising the core principles of UN peacekeeping. It is high time the international community agreed on a comprehensive legal framework for the use of new military technologies, especially in peacekeeping. 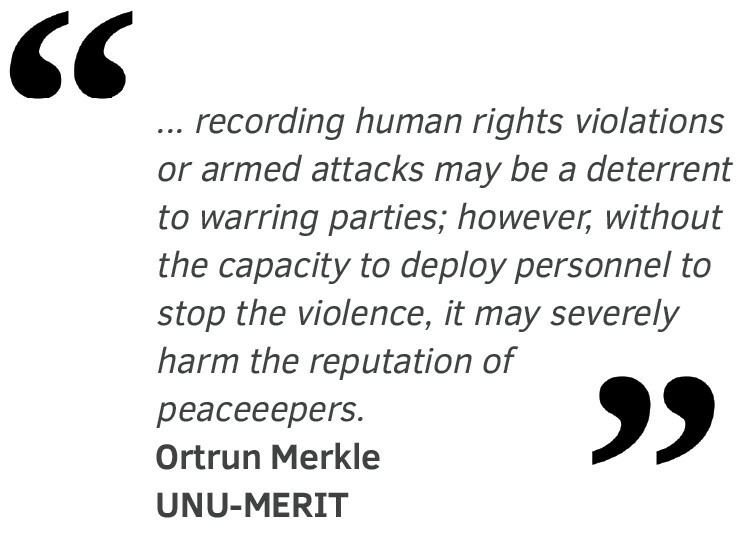 Ortrun Merkle is a PhD Fellow at UNU-MERIT and its School of Governance. 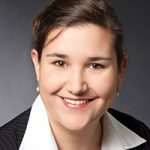 Her thesis focuses on the role of corruption in state-building and specifically the role of civil society and external actors in the process. She is especially interested in the mechanisms that lead to state-building failures and subsequently increase the risk of conflict recurrence.